Three months ago, a controversial law took effect in Oklahoma that requires people arrested on felony charges to give a DNA sample to law enforcement agencies. But so far, no DNA has been collected under the law. And it may be at least a year and a half before collections begin. The reason boils down to money. Because of a lack of state funding, the Oklahoma State Bureau of Investigation says it cannot afford to hire analysts and purchase collection kits and other equipment to gather and process arrestees’ DNA. The genetic material continues to be collected from individuals convicted of felonies and selected misdemeanors. 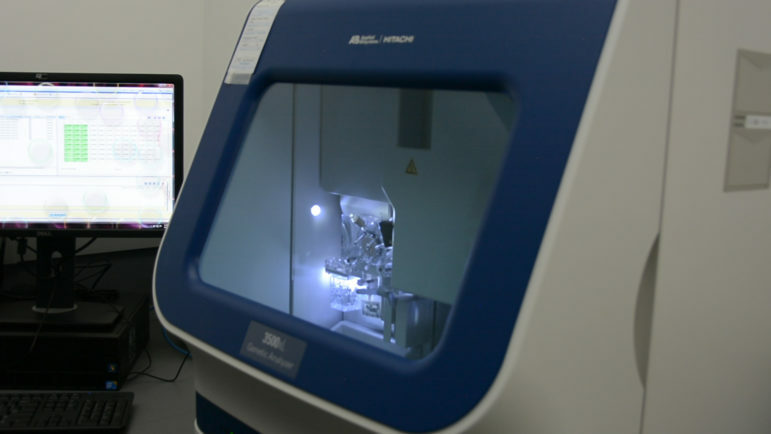 DNA analysis equipment in an Oklahoma State Bureau of Investigation lab. One legislative leader said that the roughly $1 million a year needed for the program likely won’t be approved during the upcoming session. The state is facing an estimated $870 million budget shortfall for fiscal 2018, and lawmakers are focused on how to avoid deep cuts in core services such as education, corrections and health care. OSBI’s budget for the current year, fiscal 2017, is $12.4 million, or 4.6 percent lower than its revised 2016 budget. More than 30 states have approved collection of DNA from individuals arrested on felony charges but not yet convicted. Oklahoma’s law, which applies those 18 and over, requires that the DNA profile be expunged from the database if a felony charge is not filed or the charge is dismissed by the state or a court. Law enforcement agencies say running DNA on felony arrestees can help them solve cold cases. DNA profiles become a part of the FBI’s national Combined DNA Index System, or CODIS. FBI data indicates that through November 2016, about 150,000 profile samples from Oklahoma have assisted in 2,702 investigations. Taking genetic material from arrestees has drawn sharp criticism from civil-rights groups, including the American Civil Liberties Union of Oklahoma. The ACLU says the practice infringes on privacy rights as it forces people not convicted to surrender personal identifying information to a national law-enforcement database. But for now, Oklahoma’s program is on hold. Oklahoma City Police Department Capt. Paco Balderrama said the department is prepared to move forward once the funding is in place. “We plan, obviously, to comply with this law because we hope that it’s going to help law enforcement in the long run,” Balderrama said.